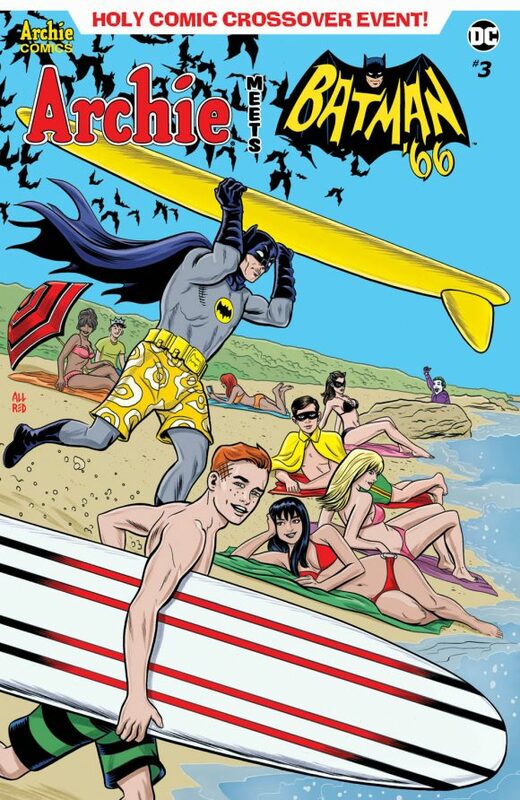 Archie Meets Batman ’66 looks to be one of the grooviest comics coming out this summer, as the Caped Crusaders make their way to Riverdale where hijinks will almost certainly ensue. The six-issue miniseries launches in July (click here). Can’t wait. But get this, September’s solicitations are out next week — and we’ve not only got the inside scooplet on Issue #3 due in September, we’ve got your EXCLUSIVE FIRST LOOK at all six covers. Yep, six covers by some of comics’ top artists. I dunno, what should we call it? How about Surf’s Up! Riverdale’s Under! Next up? Art Baltazar (click here) and Howard Chaykin (click here)! — Writers Tease What’s Coming in ARCHIE MEETS BATMAN ’66. Click here. — Art Team Talks ARCHIE MEETS BATMAN ’66. Click here. Robin looks more interested in Archie.